This article is a summary of an address given to District Veterinarians at their Centenary Conference in Orange on 20 March 2018. 1 What’s in the news? Rockmelons: Four people are dead following listeria contamination at a single farm in the Riverina district of NSW. Consumer reaction has gone beyond the identified and well-managed response to this risk: demand for rockmelons from all sources is down 90%, even Western Australian growers are affected and have been discarding fruit that can’t be sold; farm staff have been laid off. An industry spokesperson stated that it will take years to restore confidence based on a prior salmonella scare. Prices are down. The parallels between this example of consumer over-reaction to a threat to product integrity of fruit, and the reaction to a farm animal issue are striking. To digress to old news - in Japan in 2001 consumer demand for beef fell 60% after a case of BSE, and eventually stabilised at a level 20% below the pre-BSE level. Although this is an historical case the ramifications have been far reaching. Japan soon introduced a beef traceability system, and today consumers can use a web site to identify the farm of origin of beef purchased in a supermarket, or in the case of imported product, the country of origin. More than 80% of Japanese consumers believe this system is necessary based on a large survey. Choose wisely: The RSPCA has launched a new service for consumers to enable selection of restaurants, cafes and other venues based on their commitment to humane treatment of animals. There have been full page advertisements in Sydney papers over the last 2 weeks. The website includes a tool to find venues by postcode or suburb, linked to on-line mapping tools. The website is linked to major social media platforms such as Facebook. Three restaurants in Orange are currently linked to this service (www.choosewisely.org accessed 19-3-18). One might predict others will follow to avoid being left out. The site depicts eggs, chickens and pigs; we can imagine other species will be added. There is plenty of advice about humane food and suggested things to do to support the issue. These examples from the media represent a relatively new phenomenon driven by recent but profound demographic changes. The year 2006 marked the point in human history where more people lived in cities rather than in rural environments across the globe. Simply put, the majority of people now have no direct knowledge of food production. In developed countries the demographic polarisation is more dramatic and of longer standing. This has led to sometimes bizarre consumer perceptions around the myriad issues of food. Furthermore, significant communication problems exist for the agricultural sector in a parliamentary democracy where urban issues predominate. Food production in the Sydney basin: this will fall to 6% of the city’s needs by 2031, from 20% currently, due to a construction boom to house the growing population. Food is going to come from somewhere else. Dairy industry decline: once there were 1,000 farmers in the Hunter valley, 8 years ago there were 150, now there are 50, and more are leaving. The industry is consolidating in fewer larger farms, elsewhere. White spot syndrome virus in prawns: a major biosecurity failure associated with importation of uncooked prawns is likely to have led to epizootics on prawn farms in Queensland according to the Inspector General of Biosecurity. In summary, during the week prior to this Centenary conference the media was peppered with issues of great relevance to public veterinary practice. There is nothing special about that week – so what is going on? These issues represent the changing face of the global food supply (Table 1). They present a profound reason for greater engagement of public practice veterinarians because of the unquestionable link between this change process and animal and human health and prosperity. There are some impressive statistics in farming, even though current data are hard to find: 17% of working Australians are employed directly and indirectly in farming, 50% of these in capital cities; 12% of Gross Domestic Product $72 billion; 24% of goods and services exports $26 billion; utilising 60% of the Australian landmass; productivity increases of 3-4% p.a. for 20 years (only IT and telecommunications higher) (Australia’s Farm Dependent Economy, Australian Farm Institute 2005 and National Farmers Federation). Let’s consider beef alone using data from 2011: 43,763 farms produce beef cattle; national herd 26.6 million head; 2.1 million tonnes pa; 17 percent of Australian farm exports (www.nff.org.au accessed 18-3-18). The export value of beef was $10.6 billion in 2016 (www.dfat.gov.au accessed 18-3-18). Major export markets are Japan (37 percent), the United States (17 percent) and Korea (15 percent) (www.nff.org.au accessed 18-3-18). These are high value markets that pay a premium for quality. In 2005 Peter Barnard, an economist at Meat and Livestock Australia, stated “These results are remarkable and there can be no doubt that they would not have occurred but for Australia’s enviable animal health and residue status”. In 2005 Barnard also stated that loss of Pacific rim export markets for 1 yr would lead to a $4.9 billion direct loss, cattle prices would fall by 35-50%, and a FMD outbreak lasting 1 year would cost $13 billion that year. These figures if updated for 2018 would be much higher given current prices and export earnings. The potential losses and flow on effects would be catastrophic for Australian society. District veterinarians need to remember that these data and statements from an authoritative industry source are a genuine compliment and a reflection of 100 years of concerted and often unseen effort by public practice veterinarians in NSW, as part of a national animal health system (Figure 1). What could possibly go wrong? If we consider one example, live cattle exports, the scale has expanded over the last 30 years from 81,500 head in 1988 to 1,239,700 head in 2015 (www.aph.gov.au accessed 18-3-18). Animal welfare issues, which have been prominent, are not the only problems to solve. In 2016 Japan banned the importation of live breeder cattle from Australia due to detection of bovine Johne’s disease during quarantine of imported cattle in Japan. Incredibly the animals had been cleared for export from Australia following a stringent protocol. An investigation by the Department of Agriculture and Water Resources Canberra followed and the export licence of one company was suspended. Trade was restored after some months, involving high level negotiations and detailed technical work by public practice veterinarians in Canberra and Japan, and laboratories in both countries. This event followed closely on a review of the national Johne’s disease program in Australia. In the new program the protection of public health is not mentioned. In Japan, public health is a major driver for BJD exclusion. 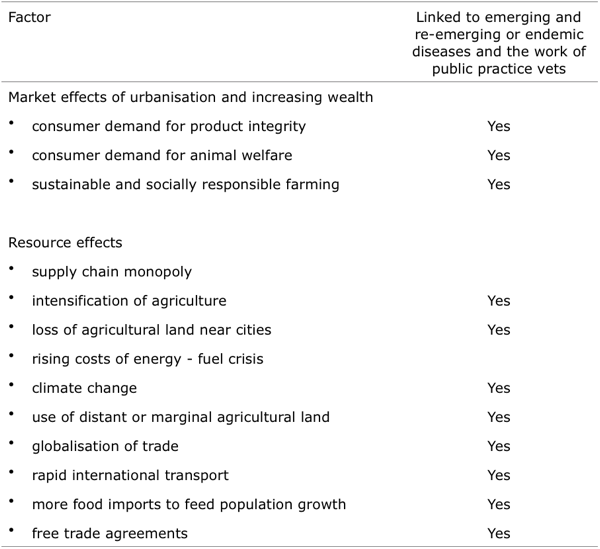 This is a very strange dichotomy between two major trading partners with similar capacity for technical assessments, and reflects the need for greater involvement of public practice veterinarians in industry education in Australia, given that industry had the lead role in shaping Australia’s national Johne’s disease policy. 3 What should we do? 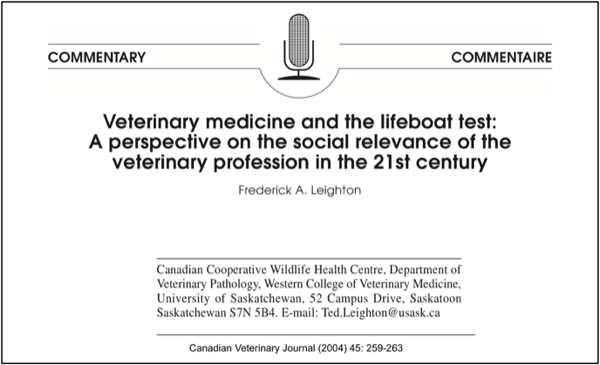 In an influential paper, Ted Leighton, writing in the Canadian Veterinary Journal in 2004, argued that veterinary science had lost social relevance, and placed undue importance on companion animal medicine (Figure 2). This type of work is probably how most of society and most politicians perceive veterinary science today, and the profession does little to counter this impression. As a result, and regardless of the true value of veterinary science, it is common for there to be quips from commentators about how they have paid for the local vets’ surgical facilities. In 2018 a Google Scholar search using the terms “Veterinary science” AND “social relevance” is just as likely to find a paper about vocal communication in humpback whales among the top hits, as it is to identify anything to do with veterinary public health (accessed 18-3-18). Figure 2. In 2004 Leighton wrote that 90% of veterinarians were in clinical practice, 70% of total activity was devoted to companion animals, this was terribly wrong, was distorted and a derangement, leaving society poorly served; it undermines capacity to serve the public in truly essential ways and directs the profession toward social irrelevance. District Veterinarians can easily claim a place in Leighton’s lifeboat. 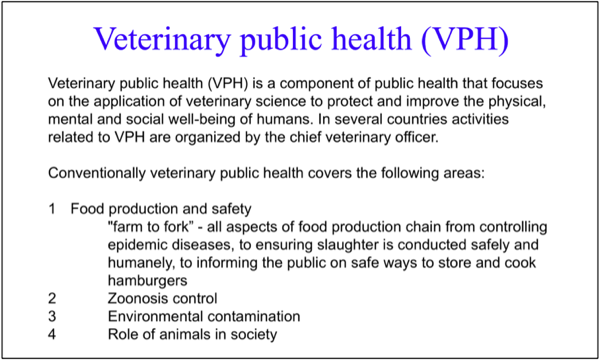 In fact they might sign on to the description of public practice currently held in Wikipedia under the heading Veterinary Public Health (Figure 3). Figure 3. Some of the diverse work of veterinary public practice is captured concisely in Wikipedia (accessed 13-3-18). It seems clear that greater advocacy for public veterinary practice has been needed for decades. Beyond the quips about vets from politicians, which have a root in their underlying belief systems, there is tangible evidence of threats to the system outlined in Figure 1. It has been under threat since the end of the Bovine Brucellosis and Tuberculosis Eradication Campaign in the early 1990s. BTEC was a successful major investment but there were legacy costs that could be reduced. BTEC created an impressive animal health system that was nationally distributed, placing field and laboratory expertise across the nation, where it is needed. Today many countries including trading partners such as Japan have such a system. But in Australia successive governments have closed regional veterinary diagnostic laboratories, down-sized the public sector animal health workforce, outsourced expertise to short term consultancies, made legislative changes shifting responsibility for biosecurity from government to industry and taken efficiency dividends. Biosecurity and emergency response is now often treated as a generic management issue. Understanding the irrefutable relationship between capacity for surveillance and control of endemic disease and emergency disease response capability has been lost by government. So far so good. 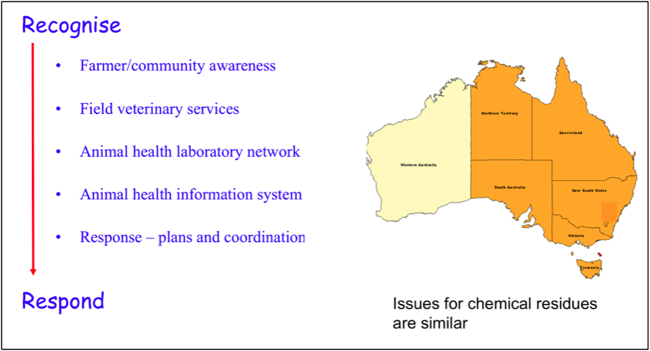 However, it is not difficult to find animal health experts in the public sector who believe Australia is not adequately prepared for a major geographically distributed event, and the nation would not cope with concurrent events. Policies on engagement in endemic disease control now differ widely between the states in Australia, and active disengagement is correlated with prevalence of significant diseases such as ovine virulent footrot and Johne’s disease. The District Veterinarian workforce in NSW is unique in Australia and in the broad assessment of this paper, is vital. However, District Veterinarians need to ask: are we influential; what is the community perception; what is the political perception; where is the current emphasis in the profession; how do we market our work; can we adapt to change? How can professionals working in a large bureaucracy be heard over the messaging controlled by “head office” or government? One answer is that District Veterinarians are part of a larger profession which has a legitimate voice in the community. In fact there is a professional responsibility to provide accurate advice to the community on matters within the scope of knowledge and experience. The DVs association is one of many veterinary organisations, each with a voice. There is need to find a common voice and politely increase advocacy. Veterinarians in public practice must awaken professional self-esteem because the achievements over 100 years have been astounding. There is opportunity to become more influential by adding non-technical skills to already impressive CVs. It is important to inform the community about current issues, progress, opportunities and threats. It is equally important to inform the government of the day. For national prosperity and security of the food supply there is demonstrable need to strengthen animal health capacity in the public sector. Veterinary public practice is essential insurance in a rapidly changing international marketplace. The author would like to acknowledge the many District Veterinarians with whom he has worked on behalf of the livestock industries since the early 1980s. Without their critical observational and technical skills and on-farm outreach capacity, many advances in detection, control and prevention of livestock diseases would not have been made.